Conventional means of backing up data, like storing it on an external hard drive or on DVDs, are rapidly becoming obsolete, due to cloud-based storage solutions. It is much easier to upload huge amounts of data to the cloud, with little or no effort, rather than waiting for a few large files to be copied or burnt. SpiderOak gives you the possibility of backing up and sharing your data via the cloud, in a convenient manner. The application's functionality is straightforward and easy to understand, but most importantly, it provides high-grade security for your data. Before you start using SpiderOak, you have to create and verify an online account. Once the initial setup is complete, you can start uploading any data you want right away. 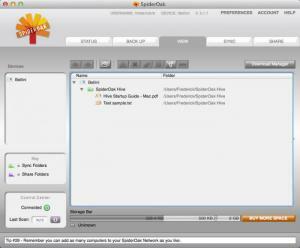 SpiderOak will create a sync folder on your disk, in which you can store the data you want to upload. Anything you copy or move to this folder will be uploaded automatically. Alternatively, you can set the application to upload data every few minutes or hours or on a certain time of the day. The same scheduling options are available for synchronizing and sharing files. Besides uploading data to the cloud, SpiderOak can also synchronize it between different devices. The application is available for PCs and Macs and for iOS and Android mobile devices. If you install it on all your devices, your files will be made available on these devices, if you store them into a sync folder. You can set up your own custom synchronization jobs between two or more folders from different platforms. Another useful feature is the possibility of sharing uploaded files, via direct link or by placing them in share folders, which you can create. Getting used to SpiderOak's functionality is not a difficult task. Its controls are very well organized on a tabbed user interface. Each tab displays important information and options, such as the status of current backup, sync or share operations. You can also find options for backing up desktop contents, documents, emails, movies and files from other common locations. A useful section of the interface is the View tab, where you can browse through uploaded data, from the sync and share folders. What's more, you can find options for downloading selected files, deleting or renaming them and for generating share links. You can synchronize data between several devices without any effort. The application can back up your data automatically, according to a schedule. Also, SpiderOak gives you several sharing possibilities for your files. While using SpiderOak, you will be able to access your important data easily, anywhere in the world, from any of your devices. You can download SpiderOak free here.